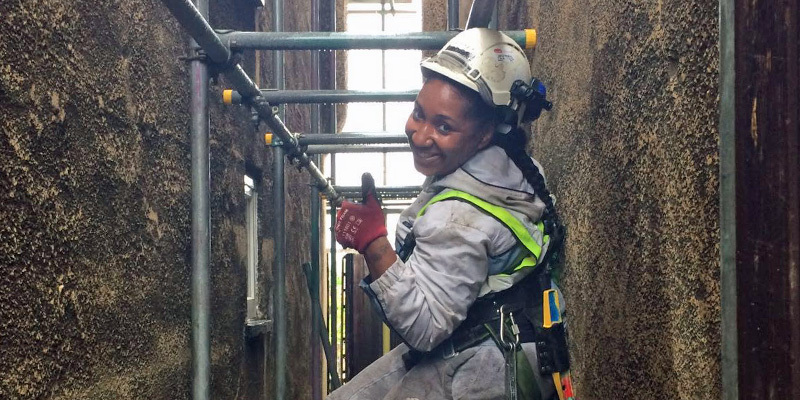 Carlene Brooks is a scaffolder at Mattison Scaffolding. Before this she trained with Brogan Group, working on the Sky Garden at 20 Fenchurch Street in the City of London as part of a scheme with Land Securities. 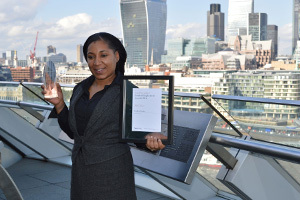 Carlene was selected as the 2014 Highest Achiever at their London Employment Awards. Since 2011, I struggled to find a full-time job while juggling studies, volunteering and part-time work. I’ve worked in many roles. I’ve been a customer service representative for a car rental company and I’ve also been a postwoman. Whilst I was studying and taking care of my daughter, I was looking for part time work in the local area. Through Jobcentre Plus, I was referred to Land Securities’ Sector Based Work Academy for Construction. 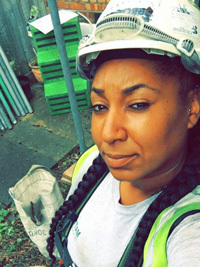 Through the Strategy, I began studying for a Construction Skills Certification Scheme certificate at Tower Hamlets College and completed two weeks of work experience as a scaffolder at 20 Fenchurch Street (known as ‘the Walkie Talkie’), which is 177 metres high. 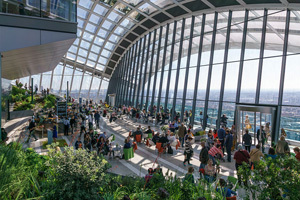 After completing my work experience, Brogan Group, the contractor hired to provide scaffolding support for the Sky Garden at 20 Fenchurch Street, were very pleased with my progress, and offered me a full-time position. I have also successfully passed my Part 1 scaffolding qualification. Working at 20 Fenchurch Street has been a fantastic experience. I have lived in London all my life and to help shape the city’s skyline, creating something that will long outlive me, has been very fulfilling. Working on the development was also a great opportunity to learn more about the different construction disciplines and building processes on large-scale projects. Dependent on where we are working I might be doing site work or street work, which is residential buildings, offices and projects like that. We’ll get to our location, our lorry will arrive, we’ll prep the lorry to get all the materials off that we need. 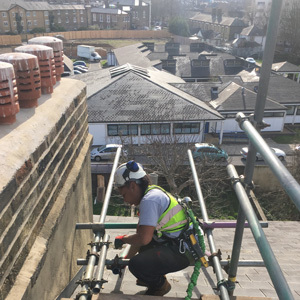 If we’re erecting a scaffold (so putting the access up) then we get all our gear together, collect the tubes, boards and fittings so the scaffold can be erected. If we’re taking down scaffolding (striking the scaffolding) we’ll sort the lorry out and literally take the gear from the more senior scaffolders and charge hands. Depending on the job itself, sometimes there’s drawings. Other than that, the charge hands on site will be the ones who decide how the scaffold is going to be erected. I’m in contact with another female scaffolder called Vicky Welch, from North Shields. She’s a Part 2 Scaffolder herself too and she reached out to me because she was intrigued that she wasn’t the only woman in the role. It’s the same for all women in roles like this where we haven’t come across another female scaffolder. She approached me via the CITB and their networks. Vicky is doing very positive things. 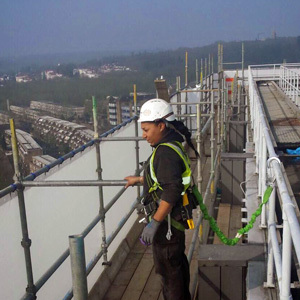 She’s got a Facebook page – Females in Scaffolding. I’m often asked if it has been difficult to move into a male-dominated industry. Throughout my years in school, young women were encouraged to pursue office roles and further education without the chance to consider other opportunities, such as trade professions. I think it’s important that women realise there is more out there than just office jobs and other lines of work typically dominated by women. There are many different career opportunities available, and male-dominated industries won’t change unless girls go for them. At school I was never told I could be a land piler or an underwater welder – those jobs were never brought to our attention! Fortunately, I think things are changing. I’m a scaffolder, not a unicorn! Everyone at both Brogan and now Mattison Scaffolding has made me feel like part of the team from the word ‘go’ and I have never experienced any negative reaction on site. It’s always been very welcoming. I think it’s more about male colleagues sometimes being apprehensive about how they ought to come across. It’s just like with any new job – you’re finding your way. Nobody wants to be looked at like they’re a unicorn on site. “Is that what she’s really doing? !” They eventually see you getting on with your job and realise that you’re just like them. The construction companies are ensuring that women are catered for as well as the men and that we’re comfortable on site. There’s welfare facilities too. If you’re a woman and you’re interested in giving construction a try, or looking for something which is challenging and rewarding, just go for it! The industry won’t change unless you do. Things are definitely moving in the right direction. The next thing I want to do is to obtain my Construction Industry Scaffolders Record Scheme (CISRS) Part 2 in Scaffolding. In construction we call these ‘tickets’ and obtaining them shows we’re more experiences and ready to progress. I always like to learn more so I can do more!